We encourage families to apply online as it simplifies submission and provides parents a tool for tracking the status of their admission online after their application has been submitted. A non-refundable fee of $35 must be submitted with each application. Is St. Andrew Catholic School Accredited? St. Andrew Catholic School is fully accredited by the Southern Association of Colleges and Schools (SACS) through AdvancED and the Diocese of Charleston. This accreditation is based on an extensive evaluation process that is both external and internal. The reevaluation process is renewed every three to five years. Our school is also a member of the National Catholic Education Association. St. Andrew School has been recognized as a National Blue Ribbon School of Excellence by the U. S. Department of Education. Where do I get my uniforms? Our uniform supplier is Lands' End. Acutal cost for a full time student is $7,050.00. Families with the financial means to pay the actual cost per student are encouraged to do so. 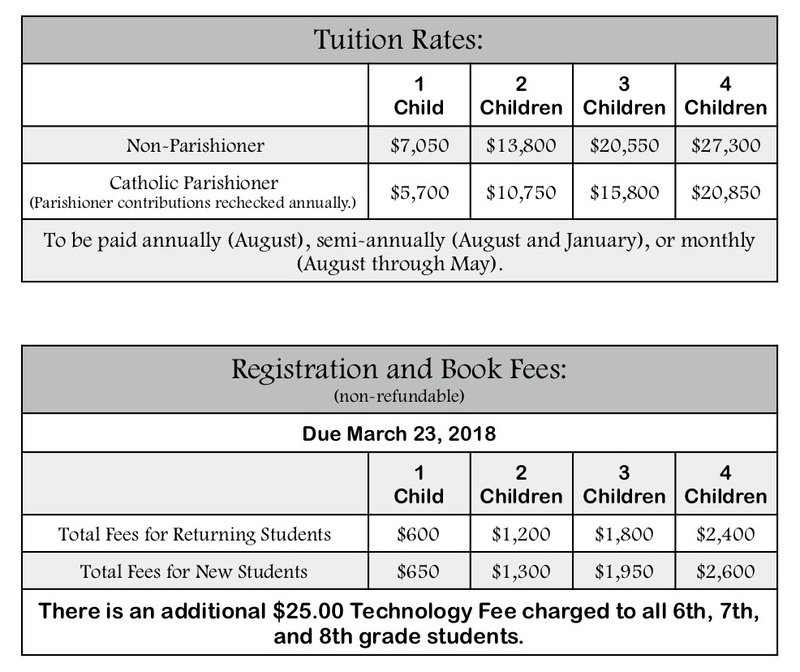 A reduced tuition is offered to practicing registered Catholic families. A letter from the home parish indicating they are in fact registered and practicing is required before your tuition rate is determined. No exceptions. Yes, the Catholic applicant must apply through FACTS. The request for aid will be reviewed and processed depending upon the availability of funds. How many students are in the school / per class? We have 210 currently enrolled students. We have up to 25 students in Kindergarten and up to 28 students in the first through eighth grade. Depending on the circumstances in the class, we may accept more. Is after school care offered? St. Andrew Catholic School's Aftercare program is offered daily when school is in session from 2:45 -5:30. During this time our qualified staff will provide a loving and nurturing environment for your child. The students will have homework/reading time, snack time, organized activities, supervised play time and on occasion be involved in community service projects. Please find the 2018-2019 Aftercare Policy here.